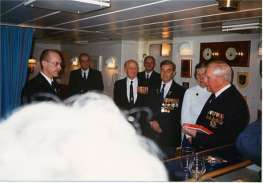 The Captain and ship's company of Her Danish Majesty's Ship TRITON are gathered on the flight deck of their ship, with veterans of the Second World War and representatives of the Royal Navy, to conduct a special service of remembrance. They are honoring the memory of the 1418 officers and men lost in the sinking of H.M.S. 'Hood' - destroyed by the guns of the Nazi battleship 'Bismarck' over fifty years before. It was the Royal Navy's single biggest loss in the war. Now, thanks to the Royal Danish Navy, 'Hood' at last receives the commemoration she and her crew have so long deserved - at the very site of her sinking. My name is Rob White. I am the producer of a new documentary about H.M.S. 'Hood', which is to be shown on the Discovery Channel in America later this month (June 1997). As the son of a naval officer, 'Hood' has long held a fascination for me: she was unique, a beautiful and powerful ship that captured the hearts of the British people, earning her the nickname 'mighty Hood'. Between the wars she "showed the flag" for Great Britain around the world, and became the most famous ship in the Royal Navy. So her sudden and dramatic loss was a terrible blow to her country. Unlike 'Bismarck', however, her story had never been told to a television audience. had a problem. How could we best show what she meant to those who knew her? The answer was to conduct a special service at the site of her loss. But how were we to do this? 'Hood' lies in the Denmark Straits - some of the most inhospitable waters in the world, especially in March. 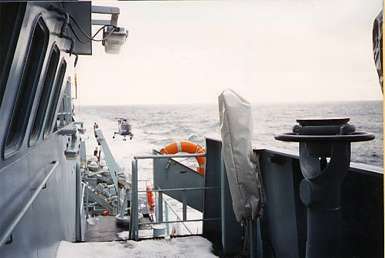 The Royal Navy were unable to help - these are no longer their patrol waters. So, with fingers crossed, I contacted Commander Senior Grade Cortes in Admiral Danish Fleet's office at Aarhus. The response I received literally exceeded all expectations - positive, friendly and so constructive that all my tentative ideas for the project were "trumped" by the Commander and his colleague Commander Senior Grade Svend E. Madsen, Captain of HDMS TRITON. Yes, we could join TRITON at Reykjavik, and go on patrol with her to the Denmark Straits off Greenland. like a chaplain for the service? And a bugler to sound the 'Last Post'? Would we like TRITON's crew to take part? It got to the point that I felt like a child opening present after present on Christmas morning! The voyage itself began brilliantly, with a special reception for our 'Hood' veterans - and the presentation of a model of their old ship, made by 'Cage Man' (Technician) Lars Rasmussen. Departing Reykjavik, TRITON arrived at the scene of 'Hood's sinking just after midnight on the same day. 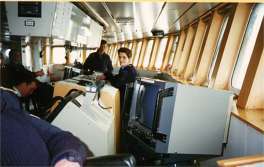 Commander Madsen immediately conducted a sonar search to find her wreck, but had no luck in the time available. Next day dawned overcast and with a sea running - but not enough to disrupt the service, which was conducted with the wholehearted assistance of Captain and crew - who each laid a red rose on the sea in memory of 'Hood' as the service concluded. All the veterans were most moved and grateful - especially as the young crew of TRITON had shown great kindness to them; many indeed had gone to the trouble of studying the history of 'Hood', and took the opportunity to talk to the veterans about her. Meanwhile we were given all the facilities we needed to film this elegant and efficient ship, from the air and from the waterline. She looked especially beautiful the day after the service, as she sailed among the ice floes of the Straits. On our return to Reykjavik, another reception was held, entertaining diplomats, officials, and representatives of the Icelandic Coastguard and media. Handsome gifts from TRITON were given to veterans and film crew alike - making all the help and hospitality we had been given all the more unforgettable. The compliment of all the kindness shown to us was returned only last month - when Commander Madsen and his wife Birgit were guests of honor at the annual reunion of the H.M.S. 'Hood' Association in Portsmouth. following day, before and after a special service at the beautiful church of St George's, close by the Royal Naval dockyard. All of us involved in the voyage feel that we have been shown so much generosity and goodwill by TRITON's captain and ship's company, and by the Royal Danish Navy, that we have a debt we can scarcely hope to repay. But the warmth and friendship we received, with the skill and efficiency of all on board, made the voyage quite literally a "once in a lifetime" experience. And TRITON and her ship's company will live in all our hearts forever. Rob White, ITN Factual, June 1997. 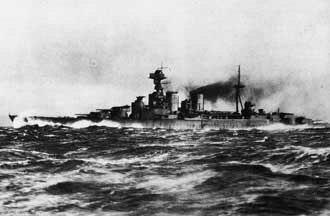 This story has previously been published on The HMS HOOD Association Website. It is published here by permission from the author and The HMS HOOD Association.